Where you spend time outdoors should be a comfortable, leisurely space. It’s hard not to imagine that would be on a deck in your backyard during a brisk spring afternoon or a mild summer evening. To get the most out of your deck, we believe it is important to think about how it will be constructed, and more importantly, what material it will be made of. If you are thinking of undergoing a professional deck construction, consider hiring a Groff Landscape Design in Arlington, Virginia. Our team of experts can help design and build your ideal deck, with an unmatched service record and a wide range of styles and materials to choose from. If you are considering constructing a wooden deck, here are the many advantages you can receive from it. Considering that Northern VA is full of forestry that grows lush during the spring and summer, building a wooden deck is a natural choice. With an appearance that shows the easy simplicity and freedom of the outdoors, it will help attract your family and guests to spend more time together outside. Wood is known to absorb less heat from sunlight than composite and stone deck materials, making it a more comfortable surface for your outdoor retreat all day long. According to Consumer Reports (2017), most choices for composite decking tend to be more on the expensive side and heavier than wood. A greater weight in material can affect the cost of labor, as well as the integrity for the structure after its been built, putting your home’s addition at risk. If you still aren’t sure whether to choose a wooden deck over composite, our team at Groff Landscape Design can help you determine which one will work best for your home while staying within your budget. There are many different types of wood to use as material for your deck, including cedar, redwood, or other tropical and exotic options. However, keep in mind that these also vary in weight, texture, color, heat absorption, and other factors you may want to consider. It’s also important to think about the safety concerns in whatever additions you make to your home, decks included. A wooden deck is much more eco-friendly than decks made of composite material, considering wood is renewable and recyclable. Constructing your deck with wood is also safer for the environment, since any sawdust or shavings left behind are biodegradable. Deck materials that are synthetic are not and can harm the environment around your home without careful maintenance. At Groff Landscaping Design, we take into account every preference in design choice and material selection, all within an affordable price range. 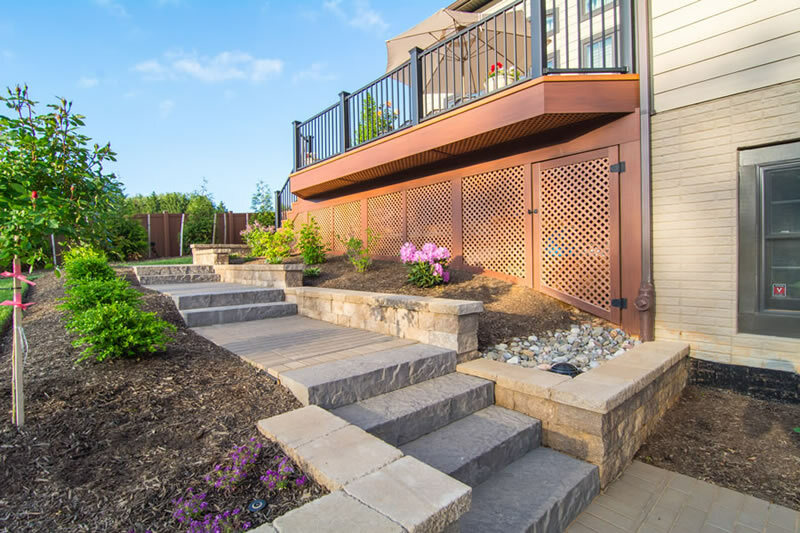 We are known to provide the best Arlington VA deck construction devoting ourselves to achieving total customer satisfaction by providing high quality service in both designing and landscaping. Complete transparency and customer-oriented service is our standard and we always prioritize sticking to your budget. Contact us today at (703)-999-8225 to learn more about our deck construction services. Get started today and improve your home look!